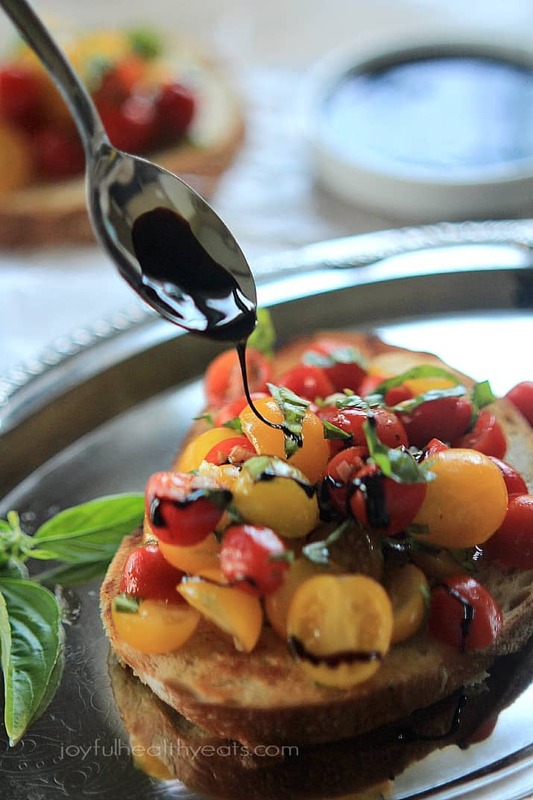 The perfect Summer appetizer to munch on, a fresh tomato Bruschetta tossed with light lemony basil, garlic olive oil, crunchy bread, and drizzled with a sweet balsamic reduction. I feel like I have been waiting to share this recipe with ya’ll for like EVER!!! I made this um… 6 months ago!!!!! I know craziness! I promise I haven’t been holding out on you. I’ve had the best of intentions to share. I took pictures… they looked horrid so I tossed them and was planning to take the pictures again but then life happened and my forgetfulness kicked in. Low and behold I was going through some of the draft recipes I had saved for a rainy day and this recipe was there. Thank goodness! I think I have told you before, but one of my favorite ‘make-shift’ date nights with Mike is to make a big spread of appetizers, open a bottle of wine, and curl up on the couch with my sweet husband and watch a movie. 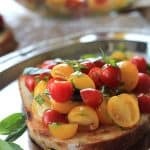 This Fresh Tomato Bruschetta recipe has quickly become one my favorites to make for that dine in date night! 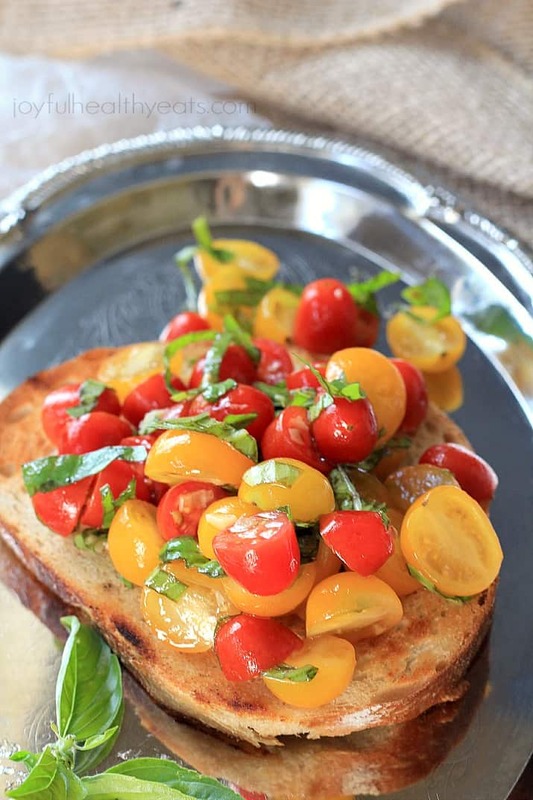 What I love about this Bruschetta is it has such a fresh flavor. 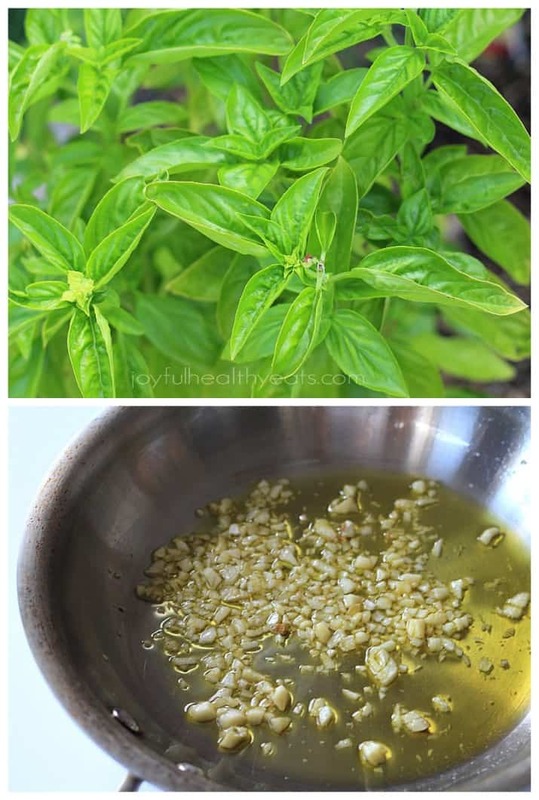 Its light and super easy to make, perfect to munch on during the summer when all the vegetables and fresh herbs are bountiful. I am all about tomatoes and decided to use two different colors to add a little more pizazz to the bruschetta, mixed it with lemony basil from my garden, some salt and pepper and topped off with a homemade garlic olive oil. I may or may consider Balsamic Reduction to be its very own food group. If you’ve had it before then you understand. But if you haven’t… shame on you! Go make some or buy some now!!! Sooooo good! 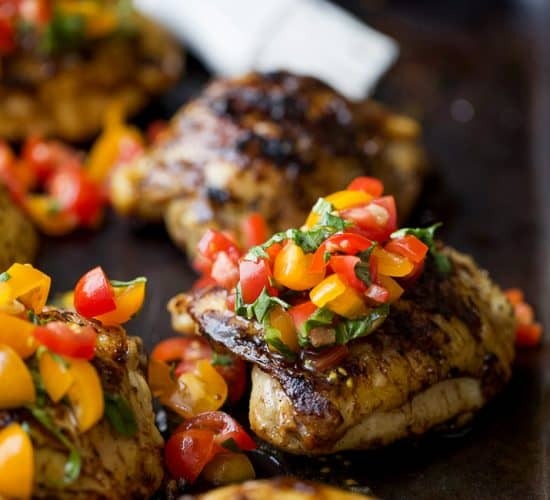 It adds tons of flavor to any recipe with just a little touch. 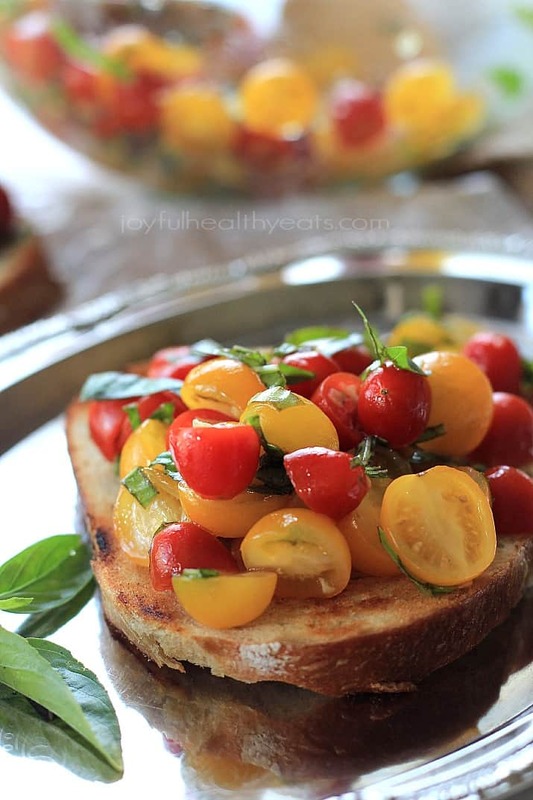 While your at it go out and buy the ingredients for this Fresh Tomato Bruschetta! It is the perfect dish to bring to the next BBQ Party or a light dinner to eat with your hunnie. Your choice, either way. Hope you enjoy! Heat small skillet to medium low heat, add 2-3 tablespoons of olive oil to pan. Next add minced garlic cloves. Saute for 2-3 minutes on low, do not burn! As soon as it becomes fragrant remove it from the heat. 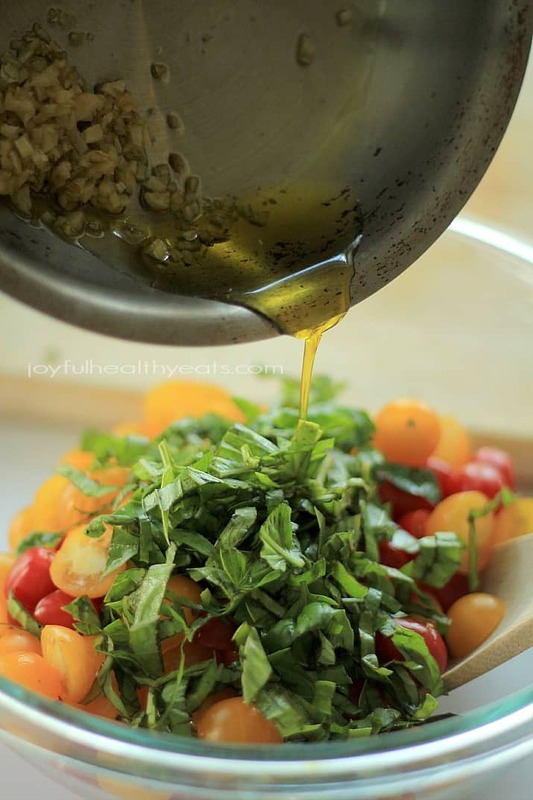 In a small bowl, add halved cherry tomatoes, halved yellow cherry tomatoes, basil, salt, pepper, and garlic olive oil. Toss to coat everything. Season with salt & pepper to taste. Heat a large saute pan to medium high heat. Add 1 tablespoon of olive oil to pan then add slices of bread. Saute each slice for 2-3 minutes on each side, until toasted. Repeat process until all bread is toasted. 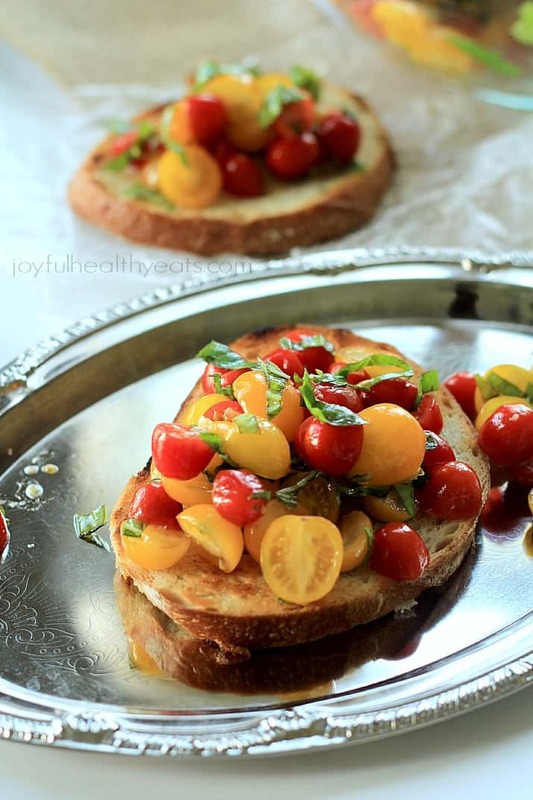 Serve fresh tomato bruschetta with balsamic reduction. 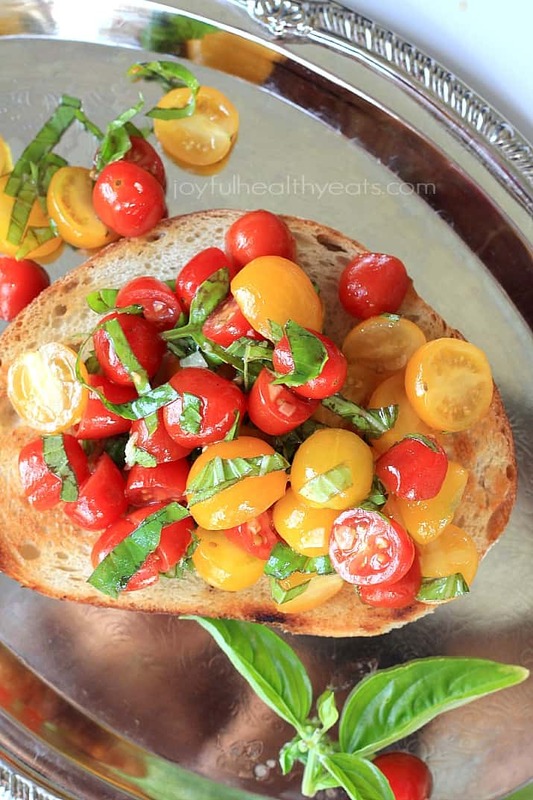 I know most people look at bruschetta as an appetizer, but I would be happy to snack on these as my actual meal :). And balsamic reduction… you can never go wrong with that. It’s just so good on almost anything! Pinned! It is seriously so good as just a meal, plus you don’t end up feeling stuffed afterward. 🙂 Thanks for the pin girl! This is one of my favorite summertime flavor combinations! Your pics are gorgeous and I love the different colored tomatoes. 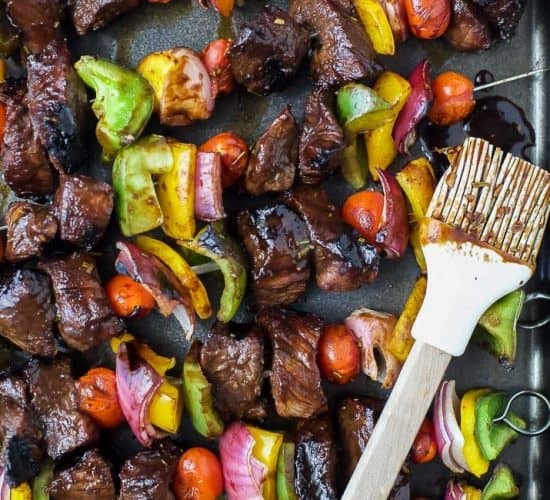 I have purchased balsamic glaze at Trader Joe’s, but I have been wondering if I can make it myself. Now I know – thank you! I’ve heard the Balsamic glaze a trader joes is great, but I still prefer homemade especially with a good balsamic vinegar. YUM! Looks delicious!! Some of my favorite flavors and perfect for summer!! Thanks Jennifer! 🙂 Some of my favorite too… and so easy to make! This really is the perfect summer appetizer! 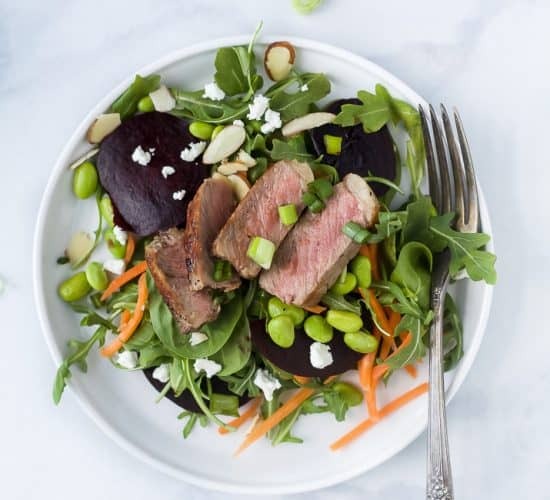 Easy, delicious, beautiful, healthy, fresh – I could go on and on!! Can’t wait to try your recipe! Thanks Cate! 🙂 Hope you love it girl! I love love love bruschetta. It’s such a fun and tasty way to eat. My friend Francesco from Roma told me once that in Italy they rub the garlic clove on the slice of toasted bread; the ratio of 1 clove per slice. :O Which is a lot. Like really a lot. I’d rather have your version. 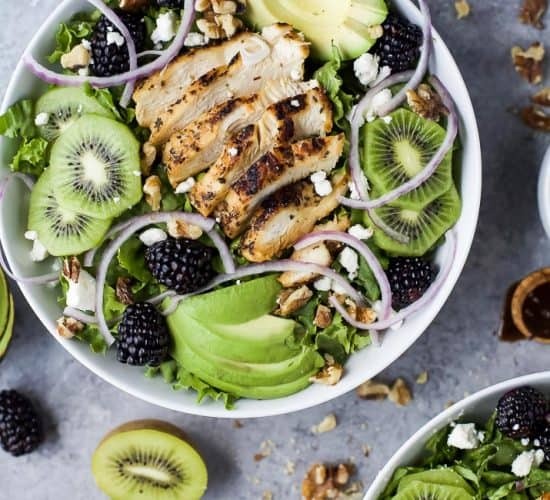 Looks so fresh and yummy with all that fresh basil and the balsamic reduction. YUM! Yeah, I’ve tried it that way before. Its really good, but I’m way to lazy to rub each slice of bread. haha! 🙂 This way still tastes great and way easier… my kinda recipe. 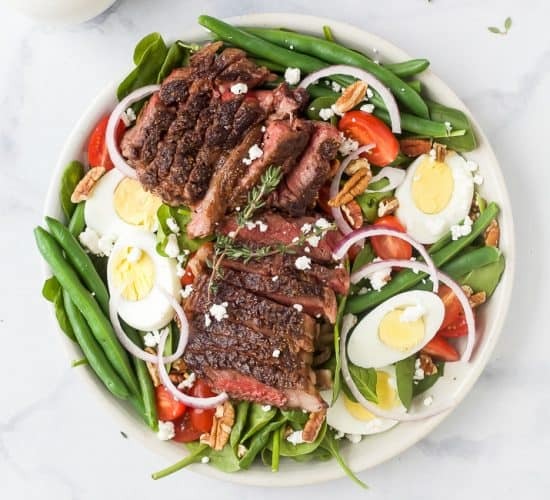 Love this, you can’t go wrong with classic, fresh flavors like this! Thanks Annie! You are so right! This looks amazing! And your pictures look fantastic! Show Stopper Saturday #46 ~ Chocolate Desserts! I have bowls FULL of beautiful, ripe heirloom tomatoes (big and small) just begging to be made into something that tastes delicious. I’ll have to give this a try! haha.. and it is soooo delicious! 🙂 Thanks for stopping by and the sweet comments Suzanne! 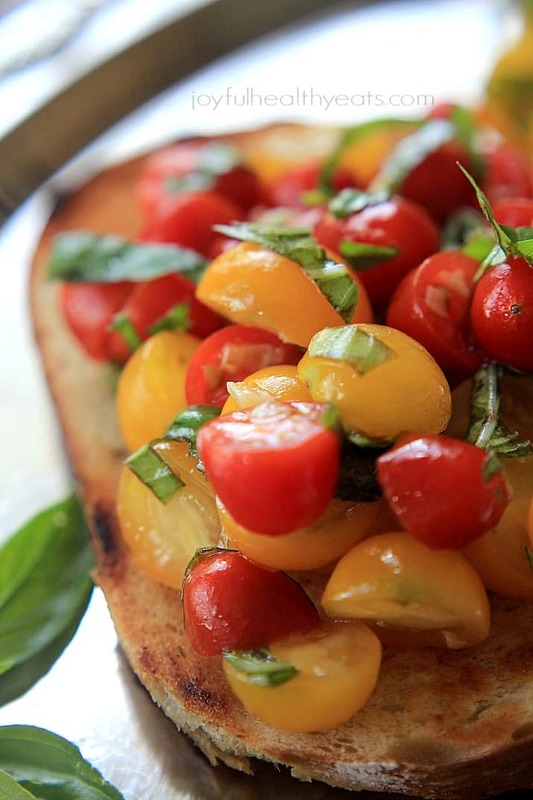 I love love love bruschetta.Can’t wait to try your recipe! These look delicious – thanks! Looks so fresh and yummy with all that fresh basil and the balsamic reduction. YUM!